Nice stuff MoMo, especially like the screwdrivers, I am a fan of those as well. stoking this thread up again,heres an old Stanley bailey #4 plane I pulled out of a bin the other day,ill tidy it up a little,anyone know its approximate age?i googled it up and have a couple of sites to wade through yet,ive never been into wood work but can appreciate a quality tool like this,it has a nice not too heavy patina and will be a perfect working tool once tuned up,old planes are a popular collectors item? it has "MADEINCAN" spaced like that cast near under the thumb screw wheel. Here's a couple of side-valve spring compressors I have. The larger one below it is by TERRYS. I think it probably dates from the 1950/60s. I don't use either for their intended purpose at present, but the TERRYS one is brilliant for pushing in brake caliper pistons! As soon as I saw the first pic here I thought of the caliper piston compressor. I have a modern tool like that. It comes in real handy for Toyota calipers that have pistons on both sides of the caliper body. I just came across this thread and just finished reading all 27 pages. 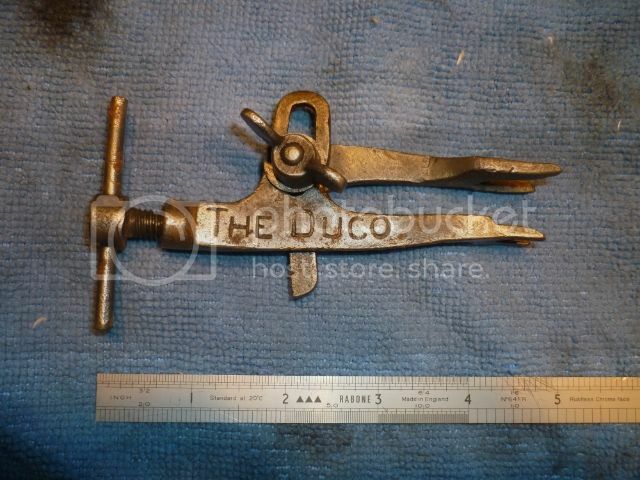 You guys have some true vintage tools here. I'm gonna have to go through my stuff and pop some pics to put up. I don't have stuff that old but still have a bunch from the 70's when I started wrenching. I didn't start professionely till early 90's but still have some stuff that isn't used anymore. We can play stump the professor with some of the younger crowd here. Cool thread!!! yeah get some pics up mrbreeze,we never know whats out there till we see it,great to see you suffered through the entire thread,you are now one of us! Those are cool tools you guys have there! These are great. My grandma passed away last year at 96 and when we were cleaning out her house I took over the basement operation and found my grandpa's old tool box (he died a couple years ago). There were some great old tools that post pics of next time I visit my parents' house. The old boy was a Canadian paratrooper and served in WWII and Korea and in that tool box I found a Luftwaffe map, a Hitler Youth belt and a few other "souvenirs" from his time in Europe. When we can no longer hear the stories first-hand, there's nothing like these pieces of history to really connect us to a past that can often feel so distant. 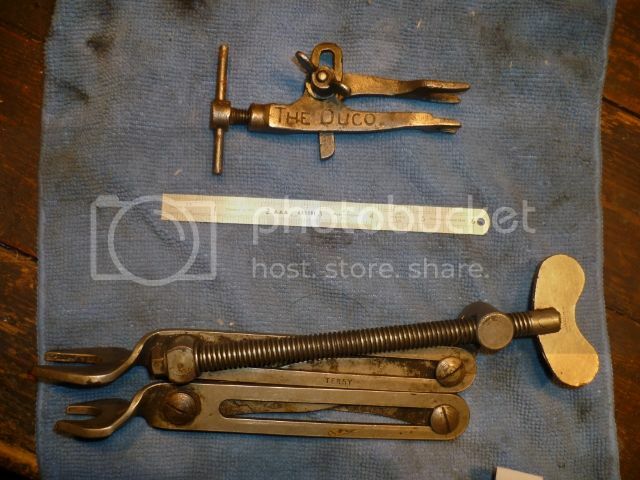 Thanks for posting these tools, they're awesome. I have the exact same plane in my toolbox Dave that my Dad bought me for my woodworking class when I was about 14yrs old. That'd make mine nearly forty (jeez!) years old. I'm sure they were around for a good few years before then too! the basic design is 100 years old!this one is missing the lateral adjustment lever. There are links at the bottom of the page to more specific info. What is this? 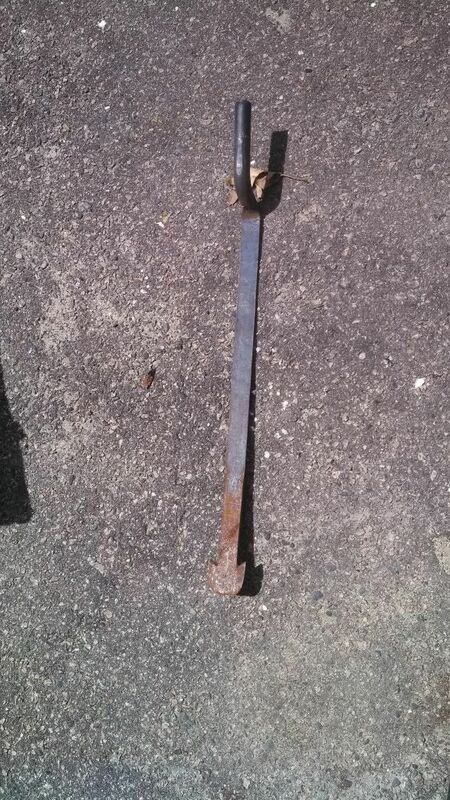 Around 28" long, steel, no markings, tapered in thickness and sharp at the ends. Isn't that a roofing tool? For sliding under the tile and pulling the ally or copper nails? It's called a slater's ripper. I pulled this mini circular saw out of a trash bin today,looks 60s?maybe earlier?not a single piece of plastic,its incomplete as the box has more spring clips inside to store things than whats in it,i thought its powered by your hand drill when I first picked it up,perhaps it had a little detachable electric motor with it?most of these tin boxes I find are empty,it has three blades in total,little hobbists tool?before the days where cheap circular saws were around? EDIT,found one on google,made in Australia,it was a complete kit with a drill that powered the saw. insert the Steptoe and sons theme tune here! Would you settle for Sanford and Son, Dave? My Dad loved that show! I have the jigsaw attachment! you can have this for postage paul if you like it?it spins by hand ok,its quite old like late 50s from my googling?australian made in Adelaide. ha!ha!too bad we didn't get that here stevo-o!,yep that's me all over,if I see a 5 cent coin ill pick it up!if you don't its unlucky not to accept free money and youll get no more!our smallest is five cents now,our one and two cent coins were phased out a while ago,they were cupro nickel copper looking things,our one cent piece was tiny!